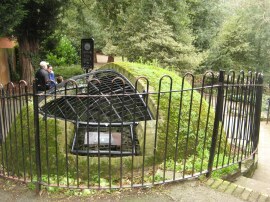 I did this walk on Sunday 6th February. I drove down and parked in a small parking bay close to Falconwood Station from where it was a 0.45 mile walk to the start point of stage 7 in Shepherdleas Wood. Driving down, the journey was about an hour quicker than if I had travelled by public transport and even though I would need to take two trains back to Falconwood from my end point that transfer time was only 38 minutes. If you have been following my walk along the Green Chain in chronological order this stretch of path marked the first part of the route that I had not previously walked at some point the past and it was good to finally be on some new ground. 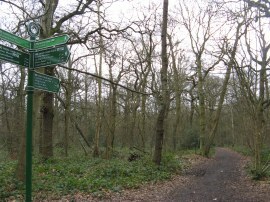 Leaving the start point in Shepherdleas Wood, photo 1, the route then follows a broad well marked course through the trees to reach the Rochester Way. 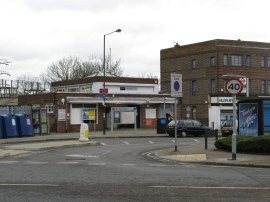 Heading right, the Green Chain Walk crosses over some railway lines and passes Falconwood Station, photo 2, then bends to the right down Reifield Road, with Eltham Park Crematorium to the left. The route then heads downhill along the road before taking a fence lined footpath on the right called Gravel Pit Lane, photo 3, that runs between houses before reaching a broader stretch of path with school buildings to the left and a golf course to the right. Reaching the end of the lane the route crosses the A210 Bexley Road, continuing ahead along a path that leads into Avery Hill Park, photo 4. 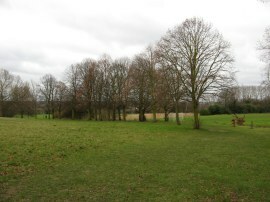 The footpath first heads alongside area of grass and then heads along a muddy path through a more enclosed area of scrubby trees before heading out in a much more open grassy area marked out with numerous playing fields. 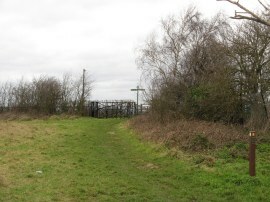 Bending round to the left, the route soon reaches a tall metal Green Chain Walk mileage post, photo 5, which marks the start of a short spur that heads off to the right to link up with route 6. 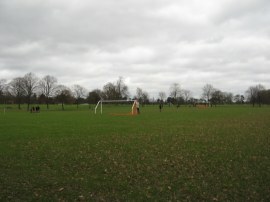 This link route heads across the top of a playing field and then heads to the right again along another track that heads gently uphill between more playing fields to reach route 6. The length of this spur was just over 0.2 of a mile and in order to ensure I walk every part of the Green Chain Walk I quickly headed there before retracing my steps back to the fingerpost. 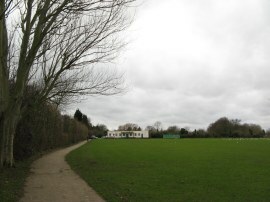 I then continued my walk along stage 7, the path following the edge of playing fields, which were being well used by Sunday footballer players, across the middle of Avery Hill Park, photo 6. Leaving the playing fields the route then continues ahead along a more enclosed fence lined stretch of path, running alongside the pitches of the Charlton Athletic Training ground on the right. On one of the pitches was a very large flock of seagulls, probably around 500 birds, which was quite an unusual site. Leaving this fence lined path the route continues ahead along Sparrows Lane. Reaching the end of lane the Green Chain Walk finger post had been twisted round to point in the wrong direction, the sign heading across the road and up Keightley Drive rather than to the right along Avery Park Road. Fortunately it was only a very few yards before I realised this must be the case and I returned back to the correct route along Avery Park Road having only walked a few yards in the wrong direction. 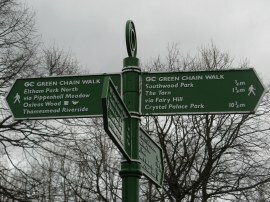 The whole of the Green Chain Walk is impeccably way marked but odd instance like this does mean it is useful to have a copy of the route map to hand. 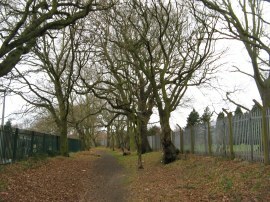 The route continues ahead into Southwood Road by Eltham Park Station before a footpath on the right that leads into Southwood Park, photo 7. Here the route heads along the grass round three sides of the small park, where there was a very unruly dog and its equally unruly owner, before heading back up past the clubhouse and along a driveway to rejoin Southwood Road. Here the route heads to the right for a short distance before heading to the right down Parkview Road. This is followed round to the left and over Green Lane into Broad Lawn. Where Broad lawn bends to the left the route continues ahead into Fairy Hill Park. 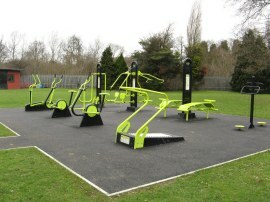 In the park there was set of shiny new outdoor gym equipment, photo 8, something I have seen in several parks while on the Green Chain Walk. Leaving the park the route continues ahead along Crossmead to reach Court Road by Mottingham Station. Here the route turns to the right, crossing over the railway lines before turning right almost immediately again to enter another small park known as The Tarn. 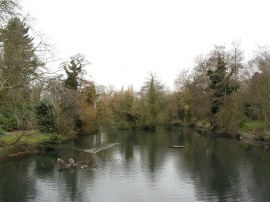 Here the route heads down the side of a large pond, photo 9, crosses over a wooden footbridge at the far end, and then heads to the left alongside the other side of this attractive tree lined pond. Reaching the end of the pond the route heads up a small hill where it passes the remains of an old Ice Well, photo 10. Rejoining Court Road the route heads briefly to the left, almost to the point where the park was entered, before crossing over the road and heading to the right down Middle Park Avenue. The route continues down the road past some low flats before joining a footpath on the right that heads uphill alongside allotments. This then continues uphill through a patch of scrubby ground before heading to the left to reach a level area besides a paddock from where it is just a short distance ahead to King John's Walk which marks the end point of stage seven of the Green Chain Walk, photo 11. The GPS said 5.22 miles when I reached the end of the stage which meant I had walked a further 4.77 miles along the path, including the there and back along the link path in Avery Hill Park. I have uploaded the route of the days walk, including stage 7 which can be accessed here Green Chain Walk Sections 7 and 8 Route . From King John's Walk I then turned to my left and made my way along the tail end of route 6 which I had walked the previous week over to the start point of stage 8 at Mottingham Lane.